The frosty colors of winter have augmented your décor and our winter candy jar favors are a perfect finishing touch. 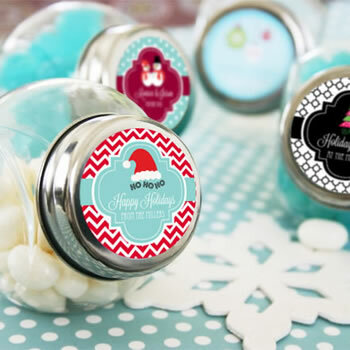 The winter candy jar favors are available in a wide variety of winter designs. These unique favors are the perfect size to put some of your favorite sweets into and can be reused for years to come. Each of the vintage miniature glass candy jars measures 2.75" by 1.75" and can be personalized to include your names and wedding date. Treat your guests to something sweet, beautifully presented inside these winter candy jar favors. Due to personalization, a minimum of 24 must be ordered at a time. These are the cutest and most versatile little jars that I've come across in quite a while. The ability to customize the label allows this to be a great gift for weddings, Christmas, business gifts, etc. Very prompt delivery and a great company to do business with. I will use them again and again. What an extraordinary and inexpensive treat for office mates....so festive. We will order again!!! !